Context: Spinal anesthesia (SA) was combined with general anesthesia (GA) for achieving hemodynamic stability in laparoscopic hysterectomy. Aims: The aim of our study was to evaluate the impact of SA combined with GA in maintaining hemodynamic stability in laparoscopic hysterectomy. The secondary outcomes studied were requirement of inhaled anesthetics, vasodilators, and recovery profile. Settings and Design: We conducted a prospective, randomized study in ASAI/II patients posted for laparoscopic hysterectomy, who were willing to participate in the study. Materials and Methods: Patients were randomly assigned to receive SA with GA (group SGA) or plain GA (group GA). Group SGA received 10 mg bupivacaine (heavy) for SA. GA was administered using conventional balanced technique. Maintenance was carried out with nitrous oxide, oxygen, and isoflurane. Comparison of hemodynamic parameters was carried out during creation of pneumoperitoneum and thereafter. Total isoflurane requirement, need of vasodilators, recovery profile, and regression of SA were studied. Statistical analysis used: Descriptive statistics in the form of mean, standard deviation, frequency, and percentages were calculated for interval and categorical variables, respectively. One-way analysis of variance (ANOVA) was applied for noting significant difference between the two groups, with chi-square tests for categorical variables and post-hoc Bonferroni test for interval variables. Comparison of heart rate (HR), mean arterial pressure (MAP), SPO2, and etCO2 was done with Student's t-test or Mann-Whitney test, wherever applicable. Results: Patients in group SGA maintained stable and acceptable MAP values throughout pneumoperitoneum. The difference as compared to group GA was statistically significant (P < 0.01). Group GA showed additional requirement of metoprolol (53.33%) and higher concentration of isoflurane (P < 0.001) to combat the increased MAP. Recovery was early and quick in group SGA as against group GA (P = 0.000). There were no adverse/residual effects of SA. Conclusion: The hemodynamic repercussions during pneumoperitoneum can be effectively attenuated by combining SA and GA, without any adverse effects. Concomitant use of two anesthesia techniques for better hemodynamic variables is a widely accepted method. We decided to use this ubiquitous technique of combining SA with GA for patients undergoing laparoscopic surgeries. Despite there being a plethora of articles on the combination of epidural and general anesthesia, only a few studies focus on combining SA with GA. Among these, few authors have studied combination of SA and GA for laparoscopic cholecystectomy. Laparoscopic hysterectomy, unlike other laparoscopies, involves open/vaginal dissection as a part of completion of surgery. When SA is utilized, this vaginal dissection can be carried out with minimum anesthetic agents sufficient to prevent awareness. Motivated by this fact, the present study was designed to compare the combination of SA and GA with plain GA in patients undergoing laparoscopic hysterectomy, with the hypothesis that sympathectomy of SA overcomes the hemodynamic response of pneumoperitoneum. The primary outcome of our study was to find the impact of SA on hemodynamic repercussions of pneumoperitoneum. The secondary outcomes to be studied were requirement of isoflurane, β blocker (metoprolol), and residual effects of SA. After obtaining approval from the institutional ethical committee, 60 subjects of American Society of Anesthesiologists (ASA) physical status I/II, posted for laparoscopic hysterectomy were recruited for our study with a written and informed consent. The group size of 30 was determined by power analysis based on standard deviation data from a previous study report. Exclusion criteria were patients belonging to ASA physical status III/IV, those with contraindications to SA, and patient's refusal. Patients were randomly assigned to receive SA with GA (group SGA) or plain GA (group GA) with the sealed envelope technique by a person other than the anesthesiologist involved in the study. Inside the operation theater, baseline electrocardiogram, heart rate (HR), mean arterial pressure (MAP), and saturation were recorded. After securing an intravenous access, all patients were preloaded with lactated Ringer's solution 15 ml/kg. SA was given in sitting position with 26 G Quincke needle in L3-L4 interspace using 10 mg of heavy bupivacaine solution. Patients were immediately made supine and the table height was adjusted to reach a spinal level of T6. Onset of sensory anesthesia was checked with pin prick, and motor block assessment was carried out with modified Bromage scale. A waiting period of 20 min or time for maximal spinal action, whichever occurred earlier, was allowed to pass before GA induction. Any cases of failed SA were managed by giving GA and excluded from the study. Patients were premedicated with glycopyrrolate 0.2 mg, midazolam 0.03 mg/kg, and fentanyl 1.5 mcg/kg intravenously. All patients received ondansetron to prevent postoperative nausea and vomiting (PONV). Anesthesia was induced with 2.5% thiopentone in a dose sufficient to abolish eyelash reflex. Vecuronium 0.1 mg/kg was given to facilitate endotracheal intubation. Anesthesia was maintained with nitrous oxide and oxygen mixture (50:50), isoflurane, and vecuronium. Isoflurane was used in lowest possible concentration necessary to keep MAP and HR within 20% of baseline and at the same time maintaining bispectral index (BIS) between 40 and 60. Isoflurane requirement was quantified in each patient by measuring inspiratory concentration. The average total inspiratory concentration of isoflurane was calculated by the sum of products of inspiratory concentration and times divided by total anesthesia time. Isoflurane was adjusted in steps of 0.2% when needed to keep the hemodynamic parameters to acceptable values. When inspiratory concentration exceeded 1%, Inj. Metoprolol 0.1 mg/kg was given in titrated doses to maintain MAP. Total dose of metoprolol was also recorded. Alpha-2 agonists were avoided due to their additional sedative properties. Monitoring was carried out by the attending anesthesiologist blinded to the technique. Carbon dioxide gas was used for pneumoperitoneum and the pressure was kept between 12 and 15 mm of Hg for all patients. Time of creation of pneumoperitoneum was documented. At the end of the procedure, neuromuscular blockade was reversed with neostigmine 0.05 mg/kg and glycopyrrolate 80 mcg/kg intravenously. Patients were extubated when they regained spontaneous respiration and obeyed simple verbal commands. Inj. diclofenac 75 mg was added to last IV fluid for postoperative analgesia (postoperative requirement of analgesics was not taken into consideration in our study). Patients were observed for regression of SA in the postoperative room for the next 2 h, whichever occurred earlier. Regression of SA: This was recorded in postoperative recovery room. Patient was labeled as having regression of SA when the sensory level was below L1 and modified Bromage scale was 3. All durations were calculated considering the time of spinal injection as time 0. Descriptive statistics in the form of mean, standard deviation, frequency, and percentages were calculated for interval and categorical variables, respectively. One-way analysis of variance (ANOVA) was applied for noting significant difference between the two groups, with chi-square tests for categorical variables and post-hoc Bonferroni test for interval variables. Comparison of HR, MAP, end tidal carbon di oxide etCO 2 and oxygen saturation SPO 2 SPO2 and etCO2 was done with Student's t-test or Mann - Whitney test, wherever applicable. A confidence interval of 95% was used in all statistical tests, and significance was considered when P value was less than 0.05. All values are expressed as mean with standard deviation in parentheses, unless otherwise stated. Statistical Package for Social Sciences (SPSS) 18.0 statistical software was used for the analysis. Sixty eligible patients were enrolled for our study, with 30 in each group. The groups were comparable to each other with respect to the demographic profile and surgery characteristics [Table 1]. Baseline HR and MAP values were comparable in both groups. No significant post-spinal hypotension (MAP < 20%) was observed in any of the patients in group SGA (P = 0.885). Post intubation and till the completion of surgery, no significant difference was noted in HR in either group (P = 0.83) [Figure 1]. The most significant feature was the rise in MAP in group GA after creation of pneumoperitoneum. This rise in MAP continued throughout pneumoperitoneum and was statistically significant when compared to MAP changes in group SGA (P = 0.001). After the release of pneumoperitoneum, the difference was not statistically significant and MAP values were within 20% of baseline [Table 2]. Changes in etCO2 were comparable in both the groups (P = 0.78). 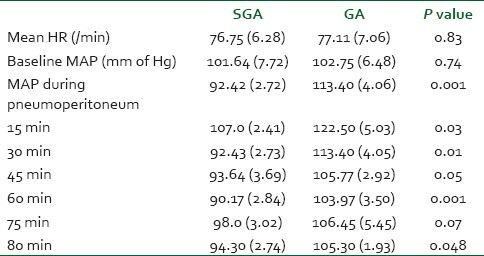 The average requirement of isoflurane during pneumoperitoneum was significantly higher in group GA as compared to group SGA (P < 0.001) [Table 3]. Strikingly, the isoflurane required for vaginal dissection too was significantly lower in group SGA. Sixteen patients in group GA (53.33%) and none in group SGA required metoprolol to combat rise in SVR during pneumoperitoneum. The average dose of metoprolol needed was 3.8 mg. The dose of vecuronium in both the groups was comparable (P = 0.0105). The changes in BIS were comparable in both the groups till the creation of pneumoperitoneum (P = 0.0988). Thereafter, a wide variation was noted. 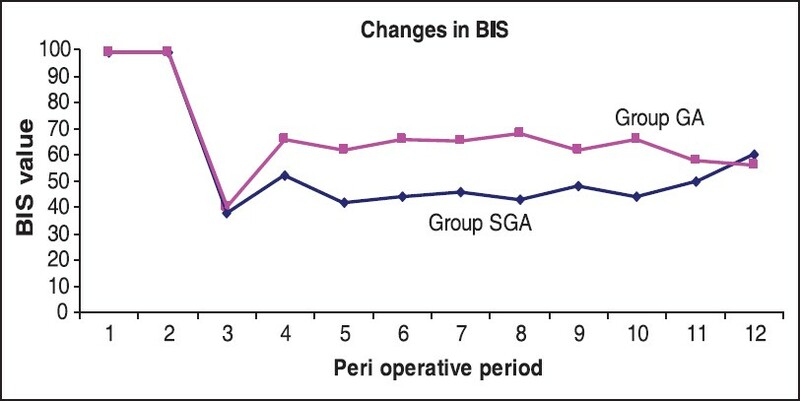 While in group GA, the excess concentration of isoflurane administered to counteract the increased MAP resulted in unnecessary deepening of anesthesia (BIS < 40), in group SGA, BIS was maintained 40-60 with only minimal concentration of isoflurane [Figure 2]. Duration of surgery was comparable in both the groups (P = 0.854). The recovery time, however, showed a significant variability in both the groups, with group GA requiring longer time to extubation as compared to group SGA (P = 0.000) [Table 3]. Surgeons were asked to grade the operative field on the basis of bowel contractility and need for head low. Surgeon's satisfaction was quantified by NRS from 1 to 10, with 1 meaning poor operative field and the need for maximum head low and 10 meaning best operative field with minimum head low. In our study, we found that NRS in SGA group was 7 (1.4) and that for GA group was 4.9 (0.9). This difference was statistically significant with P value <0.001. None of the patients in group SGA had PONV, while in group GA, five patients had PONV (P = 0.04). This difference was statistically significant. No episode of bradycardia or hypotension was noted in either group. The regression time of sensory block was 180 (26) min, while that of motor block was 132 (18) min. The maximum time a patient had to be observed in the postoperative room for regression was 52 min. Our study demonstrates that the repercussions of pneumoperitoneum can be successfully managed with a combined SA and GA technique. The combination of these two techniques provided better cardiocirculatory stability than GA alone in laparoscopic hysterectomy. Combining two anesthesia techniques to add their advantages and limit the side effects of each is not new. Luchetti et al. studied the combination of epidural and general anesthesia for laparoscopic cholecystectomy and inferred the combination to be safe and effective. Metabolic response is shown to be reduced by regional anesthesia. , In relation to combining SA and GA, comparison has been made, with positive results obtained in patients undergoing laparoscopic cholecystectomy. Encouraged by this, we conducted a prospective, randomized study to examine whether combining SA and GA improved hemodynamic stability in patients undergoing laparoscopic hysterectomy. It can be elucidated from our study that the requirement of isoflurane was markedly reduced in group SGA as compared to group GA (P < 0.001). This finding is in concordance with a study conducted by Simon et al. In our study, we found that only minimum concentration of isoflurane was required for maintenance of anesthesia. An appraisal has to be made of the finding that the isoflurane requirement decreased tremendously during vaginal dissection in group SGA, emphasizing the impact of sensory anesthesia. It was only with the aid of BIS monitoring that it was possible to closely titrate isoflurane while maintaining adequate depth of anesthesia. This finding may also imply a reduction in the cost of anesthesia, but assessing that was not the objective of present study. The unopposed parasympathetic outflow following SA causes increased bowel contractility, ultimately resulting in better operative field. It also decreases the requirement of steep head low, often demanded for laparoscopic hysterectomy. This inference is based on NRS obtained from surgeons. An interesting finding of our study is the incidence of PONV which is also a major drawback in laparoscopic surgery. , Five patients in group GA had PONV. On the other hand, none of the patients in group SGA suffered from PONV. This probably has to be attributed to the anesthetic concentrations, since by using less halogenated agents, consciousness level is recovered more quickly and secondary effects such as PONV diminish. All patients were observed for 2 h in postoperative recovery for monitoring regression of SA. It is noteworthy that all patients had regression of SA in less than 1 h in recovery, implicating no residual effects of SA. The contributions of our study are comparison of two anesthesia techniques, which, to the horizons of our knowledge, has not been studied or reported for laparoscopic hysterectomy, the appropriate utilization of anesthetic agents, evaluation of hemodynamic parameters, and studying recovery and complications. The only limitation of our study was the small number of patients studied undergoing only one kind of laparoscopic procedure. Moreover, only ASA physical status I/II patients were included in the present study, but the utility cannot be denied in high-risk, hypertensive, or obese patients. To conclude, the hemodynamic repercussions during pneumoperitoneum can be effectively attenuated by combining SA with GA without any adverse effects. We recommend this conjunction of two anesthesia techniques in patients undergoing laparoscopic hysterectomy. 1. Fisburne JI. Anesthesia for laparoscopy: Considerations, complications and techniques. J Reprod Med 1978;21:37-40. 2. Chui PT, Gin T, Oh TE. Anesthesia for laparoscopic general surgery. Anaesth Intensive Care 1993;21:163-71. 3. Jean LJ. Anesthesia for laparoscopic surgery. In: Miller RD, editor Anesthesia, 7 th ed. New York: Churchill Livingstone; 2010. p. 2185-202. Sinha R, Gurwara AK, Gupta SC. Laparoscopic surgery using spinal anesthesia. JSLS 2008;12:133-8. 4. Vaghadia H, Viskari D, Mitchell GW. Selective spinal anesthesia for out patient laparoscopy. Can J Anaesth 2001;48:256-60. 5. Rodgers A, Walker N, Schug S, McKee A, Kehlet H, van Zundert A, et al. Reduction of post operative mortality and morbidity with epidural and spinal anesthesia: Results from overview of randomized trials. BMJ 2000;321:1493. 6. Vaghadia H, Mc Leod DH, Mitcheel GW. Small dose of hypobaric lidocaine and Fentanyl for outpatients laparoscopy. Anesthesia Analg 1997;85:59. 7. Calvo-Soto P, Trujillo-Hernández B, Martínez-Contreras A, Vásquez C. Comparison of combined spinal and general anesthesia block and epidural and general anesthesia block in laparoscopic cholecystectomy. Rev Invest Clin 2009;61:482-8. 8. O'Malley C, Cunningham AJ. Physiological changes during laparoscopy. Anesthesiol Clin North Am 2001;19:1-19. 9. Odeberg S, Ljungquist O, Svenberg T, Gannedahl P, Bäckdahl M, von Rosen A, et al. Hemodynamic effects of pneumoperitoneum and the influence of posture during anesthesia for laparoscopic surgery. Acta A naesthesiol Scand 1994;38:276-83. 10. Safran DB, Orlando R. Physiological effects of pneumoperitoneum. Am J Surg 1994;167:281-6. 11. Joris J, Lamy M. Neuroendocrine changes during pneumoperitoneum for laparoscopic cholecystectomy. Br J Anaesth 1993;70:A33. 12. Feig BW, Berger DH, Doughtery TB, Dupuis JF, His B, Hickey RC, et al. Pharmacological intervention can reestablish baseline haemodynamic parameters during laparoscopy. Surgery 1994;116:733-9. 13. Mcdermott JP, Regan MC, Page R, Stokes MA, Kevin B, Moriarty DC, et al. Cardiorespiratory effects of laparoscopy with or without gas insufflation. Arch Surg 1995;130:984-8. 14. Casati A, Valentini G, Ferrari S, Senatove R, Zangrillo A, Torri G. cardiorespiratory changes during gynecological laproscopy by abdominal wall elevation: Comparison with carbon dioxide pneumoperitoneum. Br J Anaesth 1997;78:51-4. 15. Lindgren L, Koivusalu AM, Kellokumpu I. Conventional pneumoperitoneum compared with abdominal wall lift for laparoscopic cholecystectomy. Br J Anaesth 1995;75:567-72. 16. Luchetti M, Palomba R, Sica G, Massa G, Tufano R. Effectiveness and safety of combined epidural and general anesthesia for laparoscopic cholecystectomy. Reg Anesth 1996;21:465-9. 17. Lehtinen AM, Laatikainen T, Koskimies AI, Hovorka J. Modifying effects of epidural analgesia or general anesthesia on stress hormone response to laparoscopy for in vitro fertilization. J In Vitro Fert Embryo Transf 1987;4:23-9. 18. Rigg JR. Does regional block improve outcome after surgery? Anaesth Intensive Care 1991;19:404-11. 19. Yokoyama M, Ohta Y, Hirakawa M, TSuge H. Hemodynamic changes during laparoscopic cholecystectomy under different anesthesia methods. Masui 1996;45:160-6. 20. Johannsen G, Anderson M, Juhl B. The effect of general anesthesia on the haemodynamics events during laparoscopy with CO2 onsufflation. Acta Anaesthesiol Scand 1989;33:132. 21. Newton DE. Awareness in anesthesia. In: Atkinson RS, Adam P, Editors, Recent advances in anesthesia and analgesia, No.18. New York; Churchill Livingstone; 1994. p. 39-58. 22. Wong J, Song D, Blanshard H, Grady D, Chung F. Titration of isoflurane using BIS index improves early recovery of elderly patients undergoing orthopedic surgeries. Can JAnesth 2002;49:13-8. 23. Lerou JG, Booij LH. Model based administration of inhalational anesthesia. Developing a system model. Br J Anaesth 2001;86:12-28. 24. Liu SS, Carpenter RL, Mackey DC, Thirlby RC, Rupp SM, Shine TS, et al. Effects of perioperative analgesic technique on rate of recovery after colon surgery. Anesthesiology 1995;83:757-65. 25. Malins AF, Field JM, Nesling PM, Cooper GM. Nausea and vomiting after Ondansetron, metoclopromide and placebo. Br J Anaesth 1994;72:231-3.